To inject a little oomph into your makeup bag this season, I suggest you look no further than the Collection 2000’s Lasting Colour lipstick range. Apparently released with an eye on the summer trends of last year, these daring shades can provide a serious colour injection for a low price-tag! Last year my personal mission was to find a brilliant budget orange lipstick. This year it was to find a cool-toned but vivid baby pink. Ideally I was looking for something highly pigmented but affordable, and both times I swatched around and came back to this range. I own ‘Orange punch’ and ‘Bubblegum’ and the names really speak for themselves here. And while matte and highly pigmented shades such as these are often seen as high-maintenance and thus impractical – this range has a few key plus points. When I say the pigmentation in these shades is strong I mean it, but this makes them wearable in numerous ways. ‘Orange punch’ often stains my lips but that just means I use it smudged under some neutral gloss to give a pleasant tint. 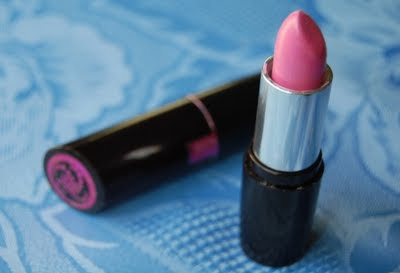 While ‘Bubblegum’ is creamier and doesn’t seem to benefit much from any of my glosses, it works well when topped with another lipstick. Once again it offers a way of giving another dimension to previously neutral lip looks. Of course I still sometimes wear these as the mattes that Collection 2000 recommend them as, my point is just that I do actually find them quite versatile. They were even released as Collection 2000’s first lipsticks with SPF15 which just makes them that little bit more practical for summer! At £2.99 each I know that these lipsticks come in considerably cheaper than many of the other brands out there. However, the range is limited to just 11 shades which means that brands like Barry M and Stargazer will probably always be the go-to for most people when they want to experiment with something a bit braver. Apologies for the limited photographs on these but I’ll definitely be featuring these products in an upcoming post of summer makeup looks. 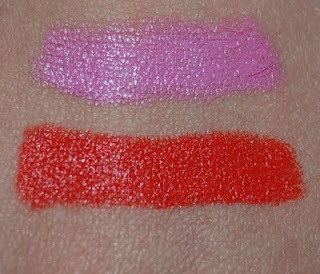 Think bold paintbox lips combined with chalky and vivid eyeshadows. Stay tuned! It's such a lovely pink and although it's very bright it's so wearable!